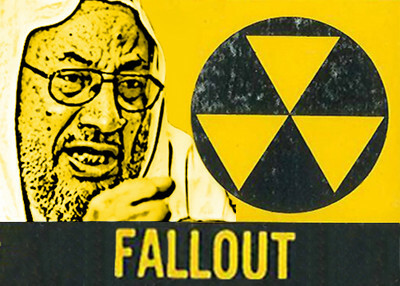 During the past month, Imam Yusuf al-Qaradawi, spiritual guide to the Muslim Brotherhood, has called on Muslims to acquire nuclear weapons "to terrorize their enemies." He also boycotted an interfaith meeting with Jews on grounds he believes they support murdering Muslims in Palestine, and he additionally said Muslims are permitted to kill Israeli women because they serve in the army. This continues Qaradawi's long-established support of violent jihad. But despite this record, he has been embraced as a "moderate" Muslim by his defenders in the West and the Arab world. In a September interview, former London Mayor Ken Livingstone said "the fact that Sheikh Qaradawi has been banned [from Britain] is a disgrace; he is one of the leading progressive voices in the Muslim world." Livingstone blamed "a huge smear campaign organized by Zionists." In America, John Esposito, a religious scholar who is close to the Brotherhood, has called Qaradawi a supporter of a "reformist interpretation of Islam and its relationship to democracy, pluralism and human rights." The Council on American-Islamic Relations (CAIR) and prominent Islamists like Tariq Ramadan, grandson of Muslim Brotherhood founder Hasan al-Banna, have expressed similar sentiments about Qaradawi. Barrie Osborne, producer of Hollywood blockbusters like The Lord of the Rings and The Matrix, has hired Qaradawi as a consultant for a movie about the Prophet Mohammed. Last month, Qaradawi was given a medal for public service by King Abdullah of Jordan. In an interview last month with Al-Jazeera's Arabic-language service, Qaradawi was asked if Muslims should try to get atomic weapons "to terrorize their enemies." Qaradawi replied that this goal would be permissible, saying he was "happy" to learn that Pakistan had such a nuclear weapon to defend itself. Qaradawi explained that that was the meaning of Koranic verses urging Muslims "to terrorize thereby the enemy of God and your enemy." Support for Iran and Muslim rights to possess nuclear technology have been recurring themes for Qaradawi. "It is obligatory on all Muslims to resist any possible attack the US might launch against Iran," Qaradawi said in a 2007 interview. "The U.S. is an enemy of Islam that has already declared war on Islam under the disguise of war on terrorism and provides Israel with unlimited support." It was wrong to deny Iran the right to ostensibly peaceful nuclear technology so long as the United States and Israel had nuclear weapons, he said. Last month, Qaradawi boycotted the 8th Doha International Center for Interfaith Dialogue conference in Qatar, saying he opposes discourse with Jews on principle. "How can we conduct a dialogue in a time when they seize lands, shed blood, burn farms, and demolish houses? Palestine's conundrum has to be resolved first before we sit together at the same table," he said. A source close to Qaradawi told the Egyptian newspaper al-Masry al-Youm that the imam does not oppose talking to Jews because of their religious affiliation, noting that he has met with representatives of the anti-Zionist Neturai Karta, an organization seen here attending a Holocaust-denial conference staged by Iranian President Mahmoud Ahmadinejad. The Neturai Karta are Jews who reject the principles of Zionism and the occupation of Muslim lands, although "the majority of Jews at present are with the actions of murder in Palestine," the source said in explaining Qaradawi's willingness to talk to the group. In a recorded address last month to a Hamas-organized parley in Gaza, Qaradawi said Palestinians must continue violence against Israel. "Arms must not be laid down; he who wants freedom must pay the price. Independence is not given as alms," Qaradawi said. According to the Arabic-language newspaper al-Watan, Qaradawi stated: "We must irrigate [the] tree of freedom with our blood. We must not leave the Palestinians alone." Every Muslim "must play his part to help our brothers in Palestine until they obtain their rights," he said. "Not one inch of the Land of Islam must remain in the grasp of infidels and occupiers." In an interview with OnIslam.net last month, Qaradawi blamed "the Zionist media machine" for popular opposition to the location of the Ground Zero Mosque. Muslims in the U.S. and abroad also have voiced opposition to the plan. Qaradawi's website glorifies violence against Jews and against Palestinians deemed to be supporters of Israel. The front page links to a section entitled "Palestine under siege." At the top of the section is an entry from May 2002 showing the body of a "Palestinian collaborator with Israel" being dragged through the streets of Hebron. It consists of Koranic verses denouncing Muslims who work with "evil Jews" to betray Hamas and other "citizen resistance fighters." In a September speech reported by the Arabic-language website moheet.com, Qaradawi called jihad an Islamic moral duty and said Muslims are permitted to kill Israeli women because they serve in the army. He said the Prophet Mohammad's prohibition on killing the innocent did not apply to Israel because it is an invader and aggressor society which only knows how to violate the rights of others. In a February interview with BBC Arabic, Qaradawi affirmed his support for suicide bombings. "I supported martyrdom operations," he said, according to a translation by the Middle East Media Research Institute (MEMRI) . "This is a necessary thing, as I told them in London. Give the Palestinians tanks, airplanes, and missiles, and they won't carry out martyrdom operations. They are forced to turn themselves into human bombs, in order to defend their land, their honor, and their homeland." According to excerpts of a speech that aired on Al-Jazeera in January 2009, Qaradawi called on Muslims to put Jews in "their place" as Hitler had done, in revenge for Israeli military operations in Gaza several weeks earlier. "Throughout history, Allah has imposed upon the [Jews] people who would punish them for their corruption," he said. "The last punishment was carried out by Hitler. By means of all the things he did to them - even though they exaggerated this issue - he managed to put them in their place. This was divine punishment for them. Allah willing, the next time will be at the hands of the believers." At a January 2009 "Gaza Victory Rally" in Doha, Qatar, Qaradawi prayed for the opportunity to kill a Jew before his death. "The only thing that I hope for is that as my life approaches its end, Allah will give me an opportunity to go to the land of Jihad and resistance, even if in a wheelchair. I will shoot Allah's enemies, the Jews, and they will throw a bomb at me, and thus, I will seal my life with martyrdom. Praise be to Allah." In a January 2009 sermon broadcast on Al-Jazeera television, Qaradawi said Allah "will not allow these people [Jews] to continue to spread corruption in the land. We wait for the revenge of Allah to descend upon them, and Allah willing, it will be by our own hands: 'Fight them, Allah will torment them by your hands, and bring them to disgrace, and will assist you against them, and will heal the hearts of the believers, and you will still the anger of your hearts.' This is my message to the treacherous Jews." He went to urge Allah not to "spare a single one of them. Oh Allah, count their numbers, and kill them, down to the very last one." Qaradawi may hold more tolerant views on other issues. But when it comes to terrorism and anti-Semitism, his words and the consistency with which he offers them, speak for themselves. Yusuf al-Qaradwi's Mirage of Rome;s conquest. i'D LOVE TO SHARE A HAM SANDWICH WITH YUSUF AL-QARADAWI. AFTER ALL HE SHOULD THINK ABOUT HIS MIRAGE OF CONQUERING ROME. NOW HE CAN EAT A DECENT MEAL AND SCOFF ON PORK. Its about time, we all wake up, and stop have moral issues. For if they talk about death & destuction, give them what they talk about, so there evil tongues my be silenced. We have fought two World wars, and now another one is due,this time it will be, The War of The Muslims for they have pick up the Banner of Hate & Destuction,but you have only received a sample of whats is to come unless you wake up from your slumber. For is evilness in all Religions but it is evil people that twist there Faith and turn peoples minds and manipulate them to there own advantage which leads to death destuction. All Western Nations including Russia,China,and Japan,need to rethink for there Future and put there minor problems aside, because you got a storm brewing of bilical proportions. There are still people who consider Qaradawi and his ilk 'moderates'.